Estate Meerschaums cross oceans of time in their lifetime of service for those lucky enough to smoke them. In a market where the buyer can find himself at odds with the skill, judgment, and honesty of the seller, the seller is sometimes found lacking in these qualities, and may be the victim of yet an older fraud himself. 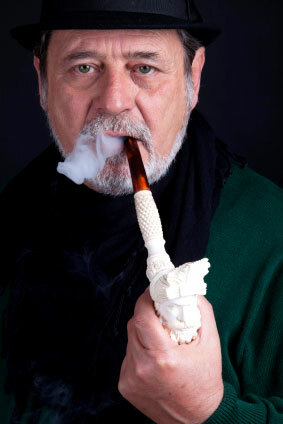 The current hazards to the buyer in the meerschaum market are not new in origin, as deception has been a common practice for hundreds of years; hence the term Meer-sham continues to have credence. It is to the buyer’s benefit to pursue an education, to learn about vintage or antique meerschaums in order to avoid the more expensive results: buyer’s remorse. The rewards of a successful acquisition are many and certainly worth the risk. Vintage (a general guide is less than 100 years old) and antique (more than 100 years old) meerschaums have gained seasoned perspectives by lessons from fire and tobacco that are simply not found in the new pipes. This is one of the reasons that I’m active in the estate meerschaum marketplace as a buyer who seeks the virtues that these old soldiers have to offer. The smoking qualities and advanced patina of these pipes are also the primary source of distraction to those who haven’t done their homework but continue to look for bargains, e.g., that overlooked Andreas Bauer. The Estate Meerschaum marketplace offers opportunity for both the budget minded and the collector of fine antiques. It also is rife with deception and prices that have little to do with product quality and value. I buy Pipes to smoke, so antiques that are for display do not interest me. Knowledge in this market is limited among many Buyers and often as not, the Sellers. Lately, the marketplace has shown the value that Buyers place on estate Pipes that have coloration. 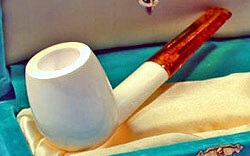 The Estate marketplace has shown the value that many place on Pipes that have been colored by means of smoking. Some of these Pipes have been either the product of smoke jar coloring or baking, where the Pipe has been heated in an oven, either in the presence of tobacco or liquid suspension. My guess is that they have been packed in moist tobacco or tobacco juices in liquid suspension, and then heated in an oven. The appearance results are different than what happens when the Pipe is smoked and waxed over time.